The Official JDLand Camera was in action on Thursday, and while the main destination will be discussed in a future post, stops were also made along Tingey Street at the Boilermaker Shops, inside both the newly opened Pacers Running store and also the decidedly-not-newly-opened Hugh & Crye menswear store. While I am not one to be shopping for either running equipment or slim-fit men's dress shirts, I appreciated that staffs at both stores did not run screaming when I came in with a camera and used those words that so often strike fear, "neighborhood blogger." I did, alas, miss the bourbon cart that was set up outside H&C earlier in the day. PS: If you want a steady social media stream of JDLand photos (current and archival), note that I have finally/belatedly joined Instagram, at jdland_dc. "For our friends in DC, the last day of operations for our Yards location will be tomorrow, Friday, July 17. As our neighborhood has grown and developed, we have always tried to meet the desires of our community, and have found that our guests would benefit from more programming and offerings from our adjoining brewery & restaurant, Bluejacket and The Arsenal. They'll be transforming the space into a bottle shop & tasting room in the coming weeks." Buzz was first announced as coming to the Boilermaker Shops in June 2011, then opened in the fall of 2013, not long after Bluejacket and the Arsenal debuted. From HillNow: "Pacers Running is expected to arrive on Tingey Street SE in August, the chain’s chief executive officer, Kathy Dalby, said today. " It will be coming to the Boilermaker Shops, and will fill the last available retail space in that building, which opened in 2013. It will be the seventh Pacers location nationwide, and fifth in the DC area, and will join Unleashed, Hugh & Crye, GNC, and Wells Cleaners in the lineup of current non-food offerings in the rehabbed building. Forest City announced this afternoon, and this tweet and its accompanying photo would seem to confirm, that local men's clothing store Hugh & Crye is coming to the Boilermaker Shops at the Yards. Known for their slim-fit dress shirts and other offerings that are tailored (ahem) to a buyer's physique type, the company operated out of a Georgetown storefront until recently, along with its main offices in Shaw. The press release from Forest City says that the location will open "next month," but We Shall See. On its web site, Hugh and Crye bills itself as a "new kind of retail company" that's "here to shake up the retail establishment along with its ridiculous margins and unsustainable practices," but that "deep down, we're a Mom and Pop." They have a program where shoppers can bring in old dress shirts and receive 10 percent off their next order, with the old items donated to Martha's Table. This is the last next-to-last empty retail space--for the moment--on Tingey Street. 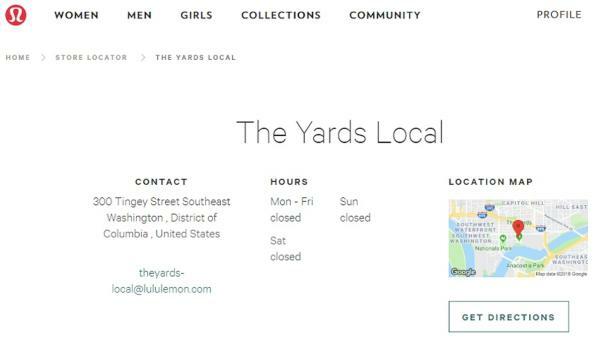 And note that Hugh & Crye is the first clothing retailer to open at the Yards, and in the entire neighborhood itself (unless you count the team store at Nats Park, I guess).